The Ford versions of these vaned rotors are 2.5 pounds lighter yet 10% stronger than original equipment while the GM rotors are 2.75 pounds lighter and 25% stronger than stock. Extra long wheel studs and bearing races are already installed. The AFCO Hybrid rotor combines the strength of a 75-81 Ford Pinto style hub with the lighter design of the Metric brake rotor for an unbeatable lightweight, and durable package. How lightweight? An astounding 14.8 pounds for the rotor with 5/8'' studs! This means it is possible to remove up to 13 pounds of un-sprung weight on the front of your car. This will improve front to rear weight bias, and wheel control. Bolt pattern is 5'' x 5''. The U.S. 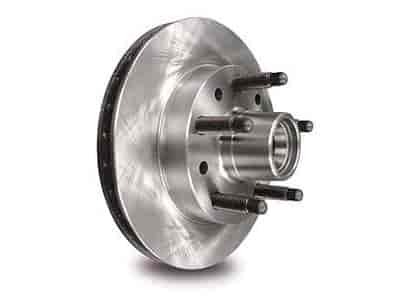 Brake Hybrid Rotor uses totally new castings designed and built specifically for racing and is IMCA legal. Measuring 10.3'' in Diameter and 0.813'' thick, this rotor will require the use of U.S. Brake caliper brackets 921-40122PL and 921-40122PR. Does AFCO 9850-6500 fit your vehicle?